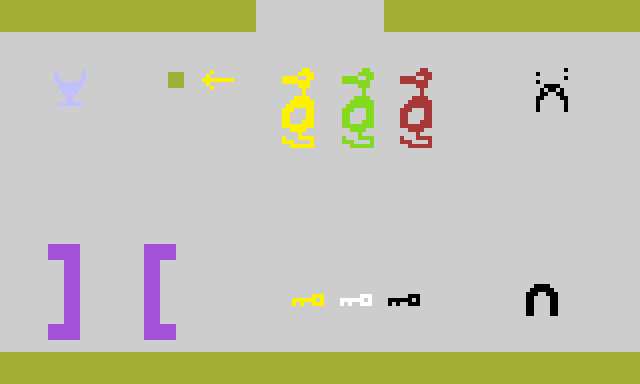 When Atari released Adventure in 1980, most players had never seen anything like it before. 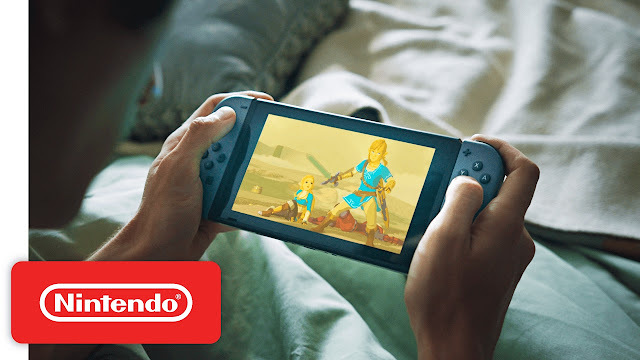 Seven years later when Nintendo released The Legend of Zelda, again it seemed that most players had never seen anything like it before. But when you start to compare the two games, there are many common design elements in both. In this blog entry, we will take a look at them. When I have talked about the Tandy 1000s in the past, and I know it has been a while, I have focused my discussions on the Tandys that were available to purchase by members of the public at Radio Shack stores. If you walked into a Radio Shack store in the 1980s and had $1,000 to spend, you could walk out with an IBM PC compatible computer. The 1000 line was cheap, fully functional as PC clones and played games as well as or better than machines that cost many times their price. But Radio Shack was not the only source from which you could obtain a 1000, and the 1000 hardware was also available to institutional buyers. So in this blog entry I am going to pull together every scrap of information I can find on the rarest, most obscure Tandy 1000s in existence. I have previously discussed both of these sound device families previous blog entries. The Yamaha IMFC and FB-01 is discussed here : http://nerdlypleasures.blogspot.com/2015/02/the-ibm-music-feature-card-overpriced.html and the Roland Sound Canvas first generation modules here : http://nerdlypleasures.blogspot.com/2013/06/first-generation-roland-gs-devices.html Rather than burying the information in those entries, I would like to add additional new information here. Early Video Game Content Advisories - Who Needs Ratings Systems? Prior to the formation of the Entertainment Software Ratings Board in 1994 there was no comprehensive content ratings systems for computer and video games in the U.S. However, that did not mean that video games never provided warnings to potential purchasers and their parents or spouses. Here let us explore the attempts to advise the public of adult-oriented content prior to and outside the eventual dominance of the ESRB. 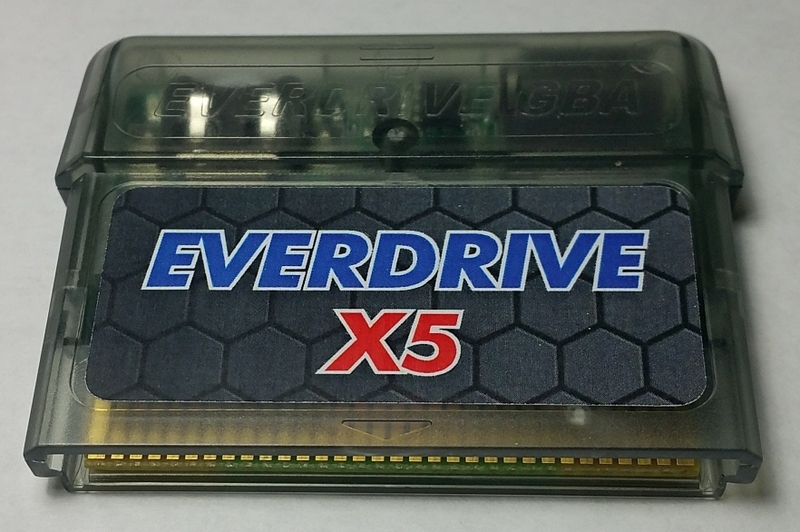 Over two years ago, a friend of mine kindly let me borrow a Turbo Duo and a Turbo EverDrive. 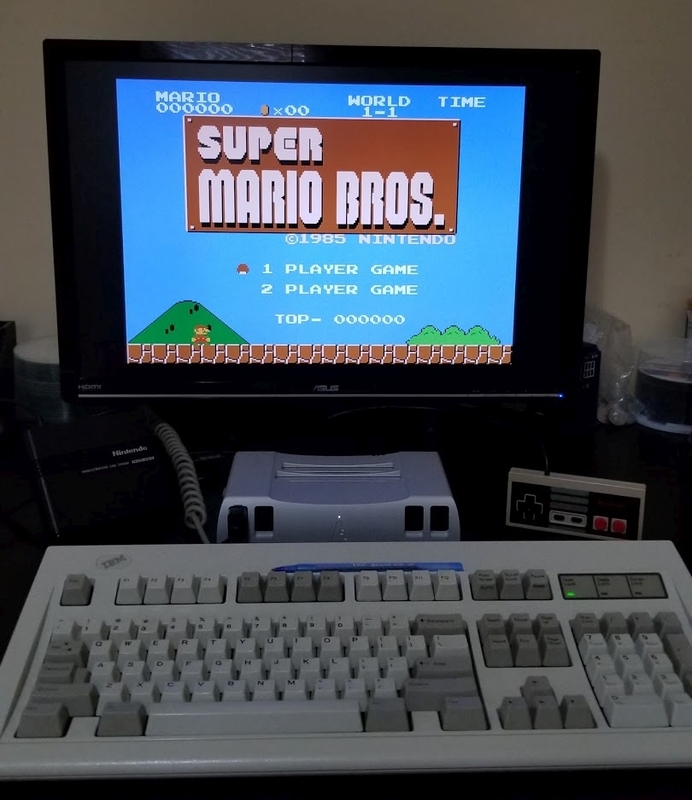 I wrote about the experience here : http://nerdlypleasures.blogspot.com/2015/04/turbo-duo-issues-and-solutions.html I had to give it back (and the Framemeister which came with it), not without a good deal of sadness. I vowed that I would find a way to play NEC Turbo games again on real hardware/ Now, I have acquired an affordable, upgradeable solution. Let me talk about it and about plans for future upgrades. 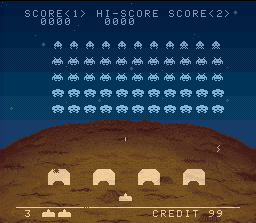 Space Invaders was released for the Game Boy in 1994. It indicated that it supported the Super Game Boy. 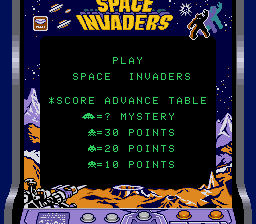 It did so in a unique way, when you selected the Arcade Mode, it launched a slightly cut-down version of the SNES Space Invaders port which had been previously only been released in Japan. The only thing missing from the game as run transferred from the Super Game Boy and the game that was released on cartridge in Japan in 1994 and the U.S. in 1997 is the VS mode. PC games were often re-released. Even though they may be older, a budget-friendly price can attract a surprising number of buyers. To keep the costs down, often games are released in smaller boxes, sometimes paper manuals turned into electronic manuals. It is not unknown for a game to be released on fewer discs/disks than it was released on originally, without being put onto a higher capacity storage medium. In this blog entry, I will discuss several famous examples where this occurred and what the effect of the disk/disc reduction was. The original King's Quest had a long history of releases for the IBM PC and compatible platforms. The game was originally developed for the enhanced graphics and sound of the IBM PCjr. 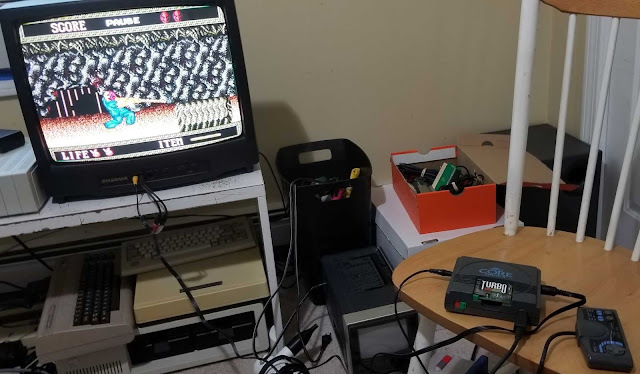 The PCjr. was hyped to the max and many media publications were predicting that IBM's consumer-focused machine would quickly dominate the home market when it was announced in November of 1983. 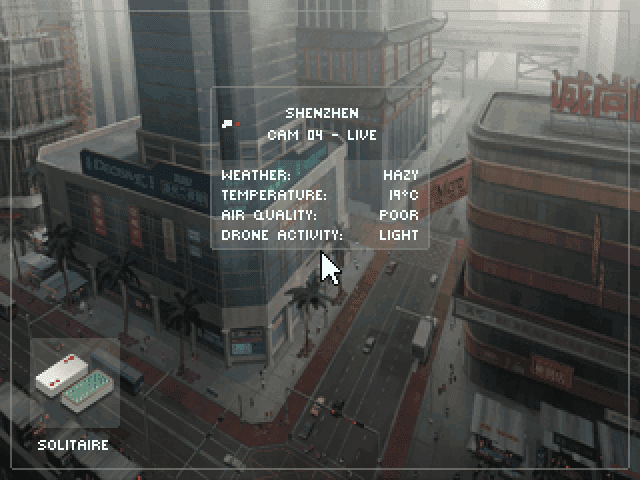 Sierra Online was facing a troubling future and made good on a deal to publish an ambitious and revolutionary game for IBM's machine. IBM bankrolled much of King's Quest's development, but the game would not be available at launch. However, by the time King's Quest was released in May of 1984, the market had shown that it was not about to become IBM's playground. 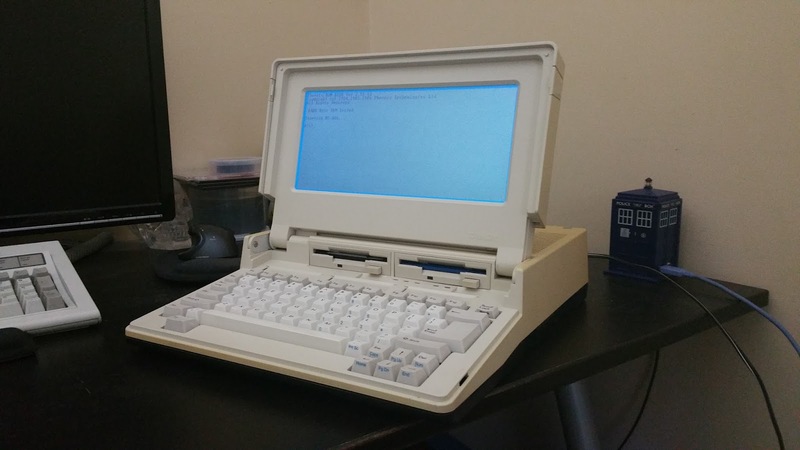 The PCjr. was overpriced cost twice as much as the Commodore 64 with a disk drive and did not offer much to the consumer that the C64 could not. The Apple IIe and //c computers were also strong competitors at the same price, offering a huge library of software. The PCjr struggled with compatibility with several popular IBM PC programs and included a keyboard that was laughable for trying to get real work done with it. About a week or two ago on this blog, I may have foreshadowed that I had acquired a new electronic item worth talking about. Portable televisions have always been of interest to me. Since TVs became mainstream in the 1950s, marketers have always tried to find ways to make TVs smaller and able to be used in more and more places across the globe. My little acquisition represents the peak of its technology for its time, so let's look at it in greater detail. The system in question is called the Realistic Portavision. Its most notable feature is that it is a fully portable color CRT TV. A sticker on the back of the unit stated it was manufactured in November of 1985. 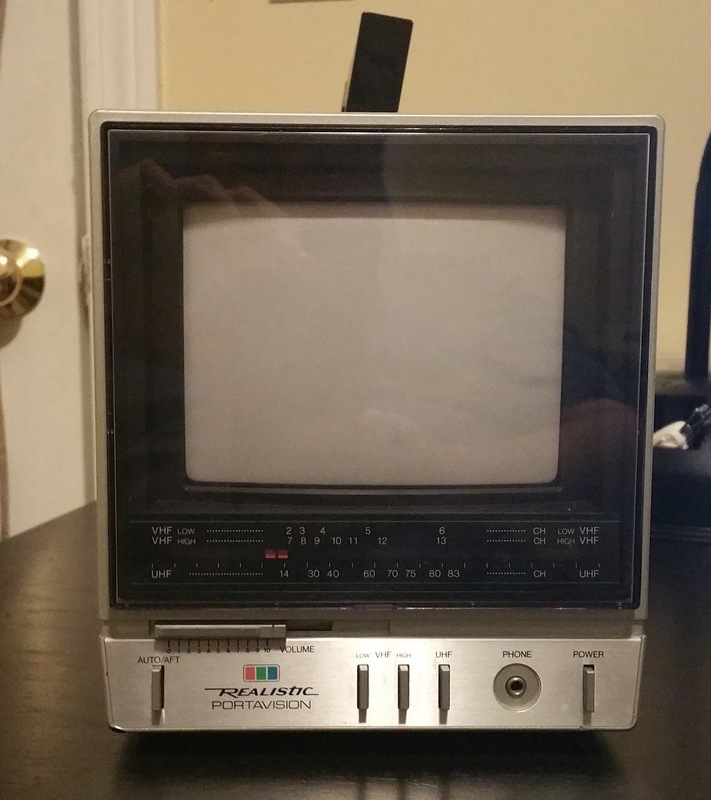 During the 1980s, portable TVs were not particularly rare. Many kitchens and campers featured one. But these TVs were typically black and white TVs. Black and white TVs were much cheaper to manufacture, required fewer components to make them work and consumed less energy. Black and white TVs in portable sizes were quite common by the mid-1970s and were manufactured throughout the 1980s. Truly nothing like the Game Boy had ever been seen before by the general public when it was released in 1989. Handheld gaming prior to that was confined to simple, single hand-held games like the Coleco mini-Arcades, the Nintendo Game and Watch series and the ubiquitous Tiger Electronics Hand-helds. These were simple games that were driven by pre-programmed microcontroller chips and drove an LCD display that was only capable of displaying a series of fixed patterns. Although the patterns could have a high level of detail, the limitations of the display severely limited the complexity and longevity of these games. The Game Boy's best-known predecessor, the Milton Bradley Microsivion, used a 16x16 display. The Microvision was not very successful and its games were put on pre-programmed microcontrollers that plugged into the main unit. These microcontrollers operated at a very low speed of 100KHz, and provided only 64 bytes of RAM and 1-2KB of ROM for a game. 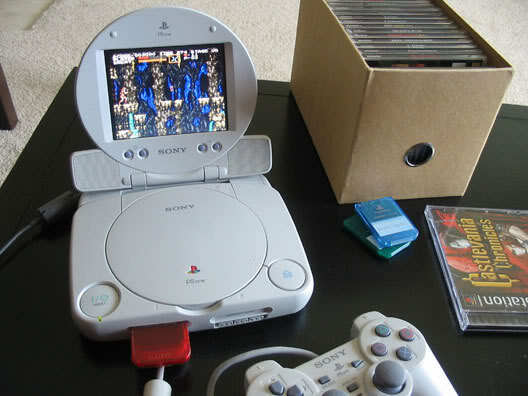 The low resolution of the display also placed severe limitations on the games that could be made for this system. The Epoch Game Pocket Computer was released in Japan in 1984 and used a 75x64 resolution display, but it was not very successful and only had five games released for it. When Metroid: Zero Mission for the Game Boy Advance was released on February 9, 2004, it was no secret that the original Metroid was included as an unlockable extra. Several months later on October 26, 2004 Metroid was released along with seven other NES games for the GBA in the Classic NES Series. People complained that buying the standalone version of Metroid was of little, if any value given that Zero Mission also contained the game and was not significantly more expensive. However, that turns out not to be the case. In 1991, Creative Labs was prospering quite well with its Sound Blaster card. Its enhanced features and reasonable price had knocked the Adlib off the hill. But a company called Mediavision released the Pro Audio Spectrum card in May of that year. The Pro Audio Spectrum was not only Adlib compatible but had a second Adlib FM sound chip for stereo music. It also had a joystick port and MIDI interface, but it supported higher digital playback and recording rates (8-bit 44.1KHz in stereo) compared to the Sound Blaster. It also required fewer jumpers to select hardware resources. It was shielded to block electrical noise and hard drive motors that can interfere with the audio output. It listened to the bus to emulate a PC Speaker. Creative caught up with the Sound Blaster Pro in November of 1991, essentially duplicating most of the new features of the PAS but retaining the increasingly-important compatibility with the original Sound Blaster. The Sound Blaster Pro was not shielded and was totally via jumpers. The PAS did not have any Sound Blaster compatibility, it was only compatible with an Adlib card. While it sold decently, it was not enough to be a Sound Blaster-killer. 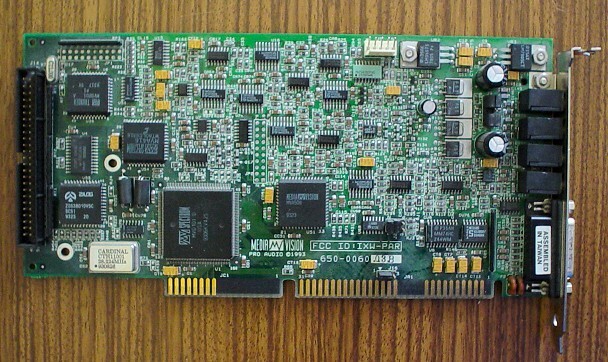 In fact, Mediavision also released a card called the Thunder Board which was Sound Blaster 1.5/DSP v2.00 compatible and could be installed alongside a PAS to support digital Sound Blaster audio. Today it is not easy to find and usually very expensive when one shows up on the secondary market. The Sound Blaster Pro (1.0) can essentially do almost everything a PAS can. While the SB Pro 1.0 is not cheap, it is more common and commands a lower price than the original PAS. But it was Mediavision's next big card that proved to be Creative Labs' most significant challenge in the sound card market space. This Christmas, I got a capture device. 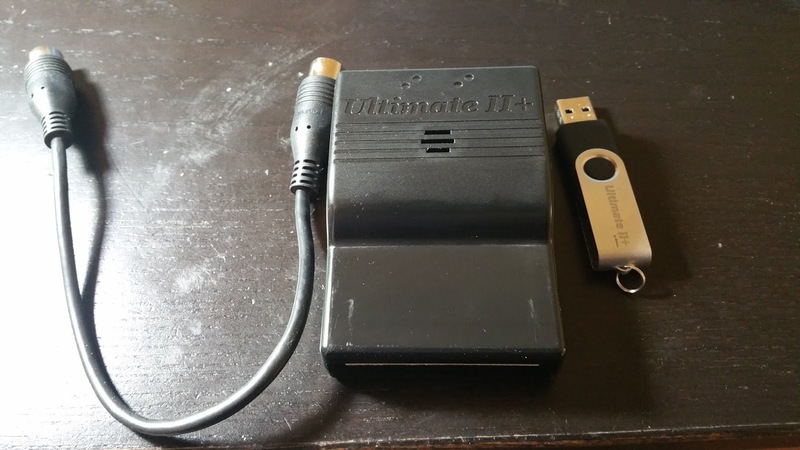 The device in question is an I-O Data GV-USB2. It can accept composite or s-video input and has stereo sound inputs. The manual is in Japanese but the drivers are in English. 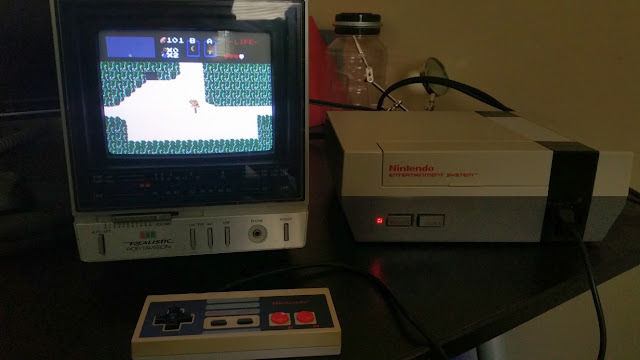 One of the reasons why I acquired this device is because I found a disturbing lack of video game footage captured from real hardware on YouTube. While there are plenty of playthroughs or longplays of various games, many of these are from emulators. Footage directly captured from consoles tends to be older and is reduced to 30 frames per second. The heyday of 480i/30 frames per second was the Playstation 2 era. 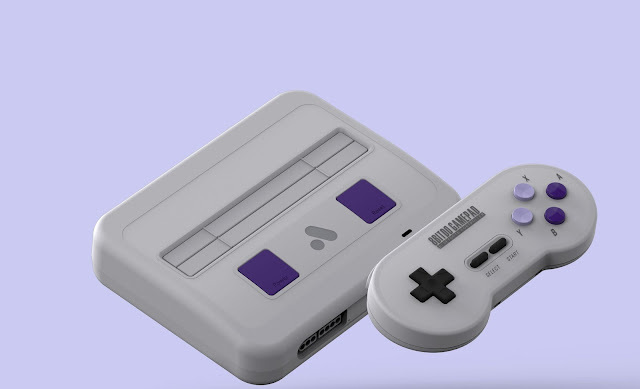 Before the Playstation 2 and the Dreamcast, it was not often used and almost never used by the SNES or Genesis. They used 240p and ran at 60fps. So did many vintage computers from Apple, TI, Commodore and Atari. Even 320x200 256 color VGA graphics is just double-scanned 240p. As many people know, 240p is a hack of 480i. TV tubes were designed to display 480 interlaced lines 60 times per second (in NTSC countries). The odd lines of an image would be displayed, followed by the even lines of an image and your eyes would see fluid motion. 30 times per second the TV would be drawing odd lines and 30 times per second the TV would be drawing even lines. 240p works by telling the TV to odd lines always, 60 times per second. Because the even lines are never being drawn, there is a space between the lines which can be noticed at times as scanlines. The console or computer is sending a complete frame for the TV to draw on the odd lines. Sega Genesis - Is the Stinker really that bad? Official Sega Genesis and Mega Drive consoles vary quite a bit in terms of their built-in sound quality. 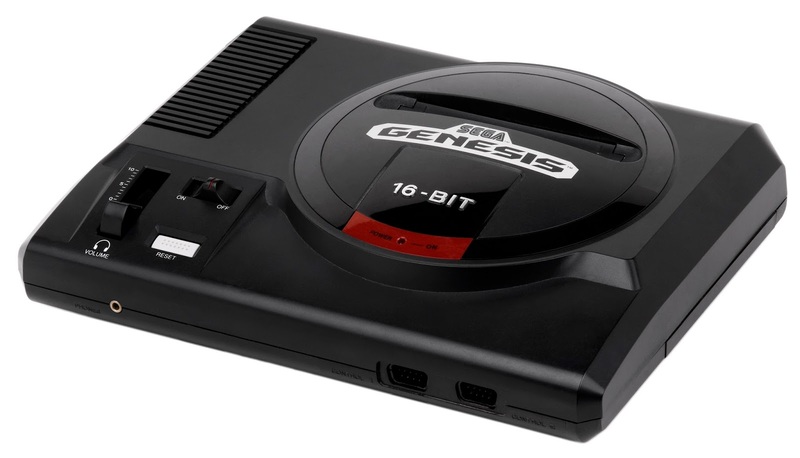 When I was looking to acquire a Genesis several years ago, I read that the conventional wisdom was that the original Model 1 was the one to get because it had the best sound quality and did not have the TMSS copy protection scheme. The original Model 1 is the one with the headphone jack and mono line audio output. 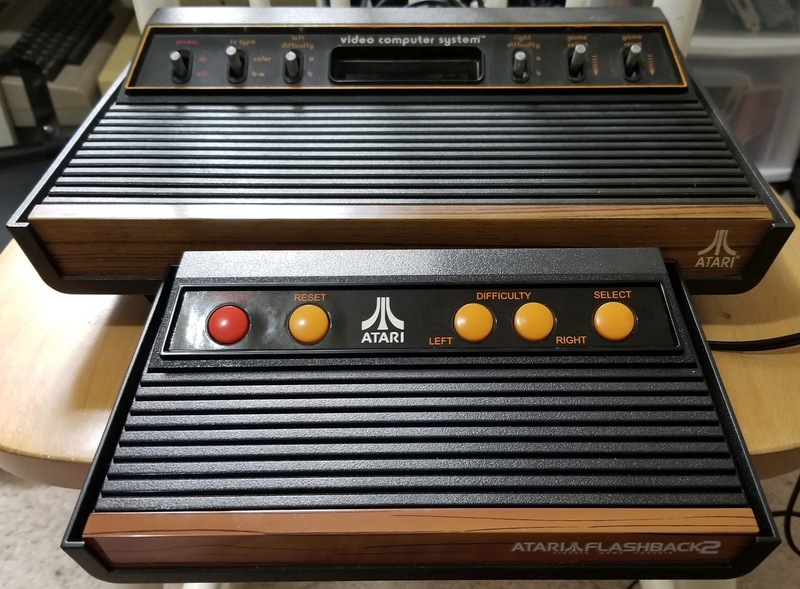 I did not know at the time that there were Model 1s with the High Definition Graphics text and Model 1s without the High Definitions Graphics above the cartridge slot. The one I acquired did not have the High Definition "HDG" text. Sometime thereafter, I found out that the non-HDG Model 1s had such terrible sound quality compared to HDG Model 1s that they have been given the nickname "the Stinker." Faced with this reputation, I quickly bought myself an HDG Model 1. I believed that all HDG consoles would not have TMSS, but the one I got did.